Ryan glances over at Chase, letting out a chuckle, before getting comfortable in his seat. “Comfy there?” He questions, earning a glance from Chase. “Very actually,” Chase answers. “Don’t mock until you try it.” Ryan just chuckles once again. “She’s pregnant, and I can’t help but worry about her. I want the best for that little bundle of joy, and you can’t blame me for caring…” Chase nods his head accepting. “She’s going to be distracted and enjoying the girl time that she’s been missing combined with racing that she won’t even notice.” Ryan knew that wasn’t the purpose of the question. “What about you?” Chase lets out a sigh, knowing the direction Ryan was headed. “I heard about the nightmares. I saw the flashback before the pageant. I get that you want to move forward, and you don’t want reminders, but you’re still dealing with stuff.” Chase lets out a sigh. “I’ll be fine, okay? Besides, isn’t that the purpose of this vacation?” Ryan nods his head. Chase and Ryan walk through the airport, glancing each direction for the sight that they were waiting for. “Ryan!! !” Erin immediately runs up to him, wrapping both arms around him. “Absolutely amazing. As much as I miss you, Emma, and our parents, I am loving Ireland. I can’t wait to show you both around. But first – it’s just so great to see you!” She then gives him another hug. “You obviously remember this guy, I hope…” Erin then glances over at Chase, and nods her head. “No, it’s fine,” Chase cuts her off. “I just don’t want reminders and thoughts about it.” She then stands up straight. “Then we won’t say a single word from here on out, okay?” He nods his head accepting. “Now when in Ireland, we must do as the Irish does and have a drink a pub. Shall we?” The group nods their head accepting. 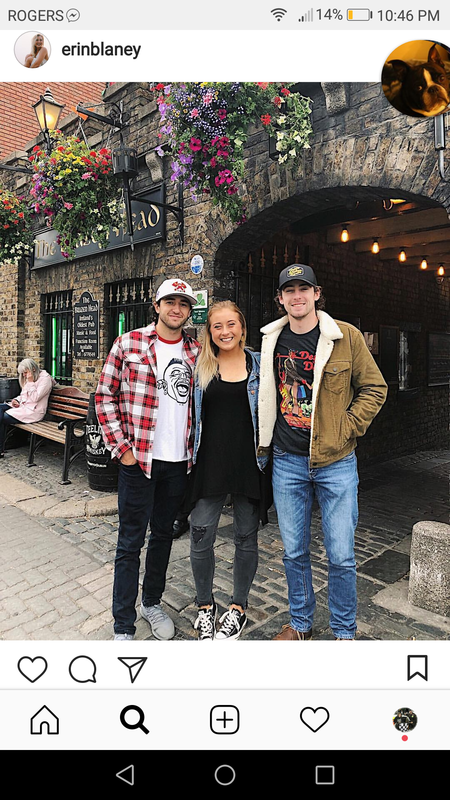 Once making the trip into town with Erin at the wheel, she takes them to one of her favorite pubs to stop in at while visiting Galway, leading the boys inside. After taking their seats and ordering a round of drinks, it was time to catch-up. Erin shared all of her adventures with friends since moving over there, assuring them both she’d show them all the highlights, while Ryan caught her up on the family business and everything that she would’ve needed to know. With everything on the table, there was only one thing remaining…. “So I have some news that I need to tell you,” Ryan starts a little nervously as he taps his hands on the table. “He already told Emma and she maybe didn’t have the best reac-” Chase starts carefully, knowing a warning would hopefully lessen the blow if any. “Oh so now I’m second rated now?” Ryan just rolls his eyes in response, as he takes a long sip of his glass. “I wanted to wait and tell you in person,” he offers, earning a curious glance from her. “Go on….” She encourages, eyes locked on her older brother. “Lindsay is pregnant. We’re due for a baby in December.” Erin looks back shocked as she glances at Chase for assurance, before locking her eyes back on Ryan. “Yes, we’ve only been together four months, Erin. But I’m absolutely certain about her and our future together. I know that she’s the right gal for me as we just click amazingly well. It was love at first sight, and it has only grown from there. I know that we’re both going to be amazing parents and we can’t wait to raise this baby together and spend our lives together.” Erin smiles a little as the happiness on Ryan’s face immediately radiated off onto her. “She expressed the same thing that you said initially, and then laid into me about making irresponsible decisions. She was also concerned, given the past for Sarina and Lindsay.” Erin glances at Chase at the mention of Sarina and takes a deep breath. “Boy?” She nods her head as their glasses touch. “I was just letting Ryan share his news and you bask in the excitement,” Chase offers. “I’ve known for awhile and I told him immediately I was happy for him, but worried about the reaction he’d get in return. I’m glad you’re on his side.” Erin puts her hand on top of Chase’s. “I appreciate that. Thank you.” Erin then takes a big sip of her glass, eyes locking on Ryan for a minute. “I was actually surprised to hear that you and Sarina got into a bit of a fight over that news, and she hasn’t come to full grips yet.” It was now Chase’s turn to give Ryan a stern glance. He didn’t mind details shared since they’d come out eventually, but he wish a line was drawn in the process. “She actually has now. It took some time, but she’s come around to believe what I was saying.” Erin then looks back over at Chase. “You wouldn’t lie, Chase. I thought she learned that already.” Chase lets out a sigh as he didn’t want to get this far into the discussion or advanced, but there was no choice. “We’re still waiting for a second opinion, and there’s options ranging from adoption to a surrogate.” Ryan then smiles a little. “You’d make a great surrogate,” Ryan offers candidly, earning a stern glance from both Chase and Erin. “That’d be a little awkward, all things considered,” Erin comments and Chase nods his head in agreement. “Since you guys are here to forget about all that for a week and have some fun, let’s try talking about something else. Say, let me discuss my plans for you both…” Chase and Ryan glance at each other concerned. “Should we be scared?” Erin just rolls her eyes as she pulls out a notebook and map. The rest of the night went smoothly as the plans fell together perfectly with excitement all around, followed by the usual banter that they normally shared when together. Though as they left the pub later that night, Ryan couldn’t help but pull Erin aside about the comments earlier. The boys head outside, following Erin as they tried to remember what she had put on the list of things to do. “So who believes in Santa Clause?” Erin asks as the boys glance at each other confused. “Erin, do you not remember the discussion with our parents?” Ryan wonders earning a chuckle from Chase. “I learned a young age, though, when I told Santa that I needed new tires for the go-kart rather than other gifts,” Chase reveals, as Erin just smiles. “I didn’t come all this way for you to give me faith and a church,” Ryan argues as Erin just rolls his eyes. “To appreciate the city, you must appreciate the artwork of the past,” Erin offers, earning a curious glance from both men. “Just go with it, Ryan….” Chase encourages as they walk down Market Street. The church, built in the 14th century, wasn’t a full stroll down the street. While not much for history of churches, there was an appreciation in knowing the church was built in dedication to St. Nicholas of Myra, the patron saint of children, better known as Santa Claus. It wasn’t long before the group was inside, taking a tour of the layout, which included various tombs and a reader’s desk. It was also neat in looking at the list of people who worshipped there, including Christopher Columbus. The afternoon plan for the boys was better, as Erin knew that she’d get them interested immediately. Considering it was also sunny for once rather than cloudy, that was an added bonus. She knew they both liked to go for decent bike rides and jogs, and there was no better spot to do that than Salthill Beach. 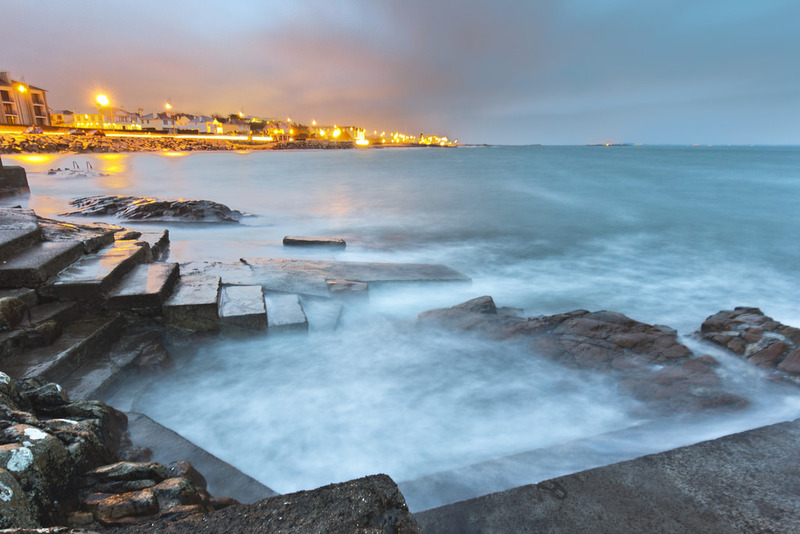 Known for its high standard of environmental quality and safety, it was one of the nicest spots to relax in Galway, whether swimming, being a beach bum, or working out. That was easily thanks to the surroundings, from a scenic view back to the city to the color of the water. “Alison can do whatever she wants, but nothing will change that if they’re truly loyal to you, and if you remain strong.” He nods his head accepting. “Don’t be questioning how strong he is now….” Ryan offers as Erin glances over at him. “I wouldn’t be so quick to past judgment over there. just promise me no jumping out of planes anymore.” Ryan chuckles as he looks over at Chase. “Can we make a pack that we’ll come here again, together?” Chase questions and Erin nods her head in agreement as the three join hands. “Heck, next time we’ll bring Lindsay and Sarina, too…” Ryan was a little surprised based on Erin comments in relation to Sarina, but was glad that she was opening up to respecting everyone. Once the sun had set and group agreed hunger was on the horizon, Erin took them to another one of the pubs she enjoyed visiting on a regular basis. The group immediately set forth on ordering some food, with their drinks. “One Guinness beer please,” Ryan orders as he places the menu down after everybody had ordered their food. 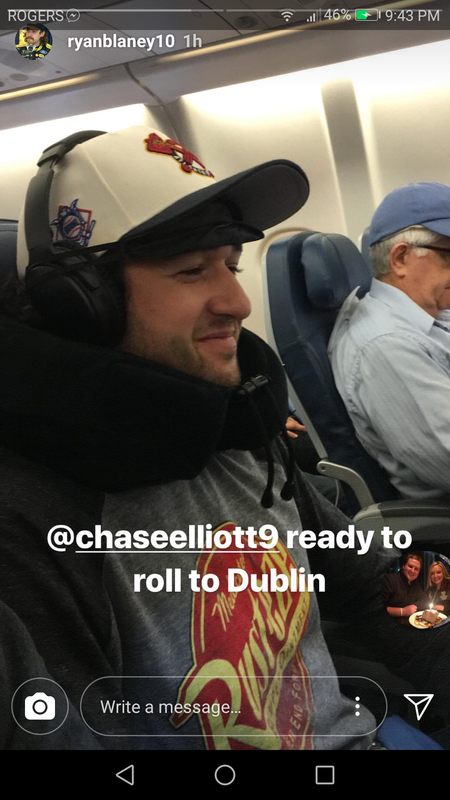 “You never drink Guinness,” Chase comments as Ryan looks over at him. “Irish brings out a different side of me…” Chase just rolls his eyes remembering the trip to Amsterdam and those adventures. “I’ve never tried a Guinness,” Erin then reveals, earning a surprised glance from both men. “Seriously?” They both question and she nods her head. 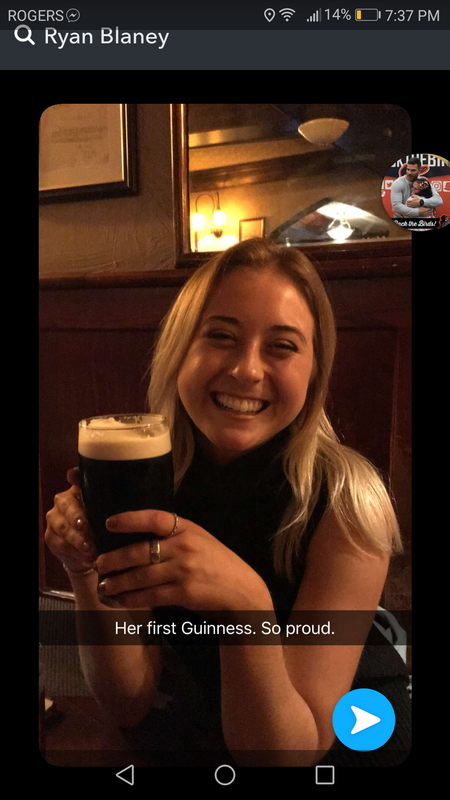 “How can you spend months in Ireland and not try a Guinness?” Ryan questions and she shrugs her shoulders. “She even suggested a tour of the plant – but yet has no idea and why they’re so good,” Chase adds as Ryan just shakes his head in disgust. “Make that three glasses, please. She’s not getting out of here without a sampling.” The waiter heads off as Ryan just continues to look at Erin surprised. “I can’t believe that we got ID’d.” Ryan then looks back towards Chase. “It’s nice to blend in for a change and just let loose without any regard,” he offers and Chase nods his head in agreement. “We went through Amsterdam and didn’t get arrested,” Chase reminds her as she nods her head, having heard about those adventures. “So do I get to see those two left feet turn into a pair of tap dancing heroes?” Chase just chuckles as he gives her a wink. Ryan could only think of every nerve in the process, knowing the feelings Erin still had. It didn’t take long for the waiter to return, placing three glasses before them. “It smells good,” Erin comments as she takes her glass, taking a wiff. “Just drink it already,” Ryan encourages as she rolls her eyes. “Better than Heinkenen?” Chase wonders, knowing her drink of choice. “You can’t beat a glass of Jack.” Erin chuckles a little, followed by holding her glass in the air.